Road maintenance, building construction, forestry – transport to and on construction sites can be a tough business. Ground conditions vary from one meter to the next and every single trip can represent various challenges. To succeed, you will need equipment that works reliably, on- and off-road, day in, day out. 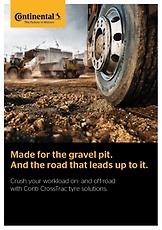 Discover the new Conti CrossTrac tire line, designed for the most challenging on- and off-road applications. And benefit from a service portfolio that reduces your total cost of ownership significantly.